This Map Plate was flown to lunar orbit on the Apollo 17 mission to the Moon. This 10.5" x 8" inch Lunar Map, from Apollo 17 Commander Gene Cernan's personal collection was used during the Apollo 17 Mission to help the Astronauts observe features on the Moon's Surface from Lunar Orbit. 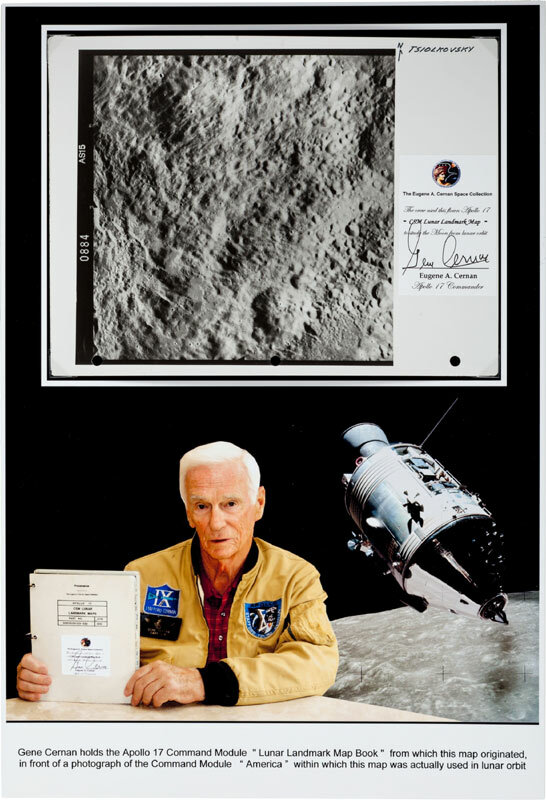 It has been printed on a glossy plastic type paper and has a Certification label attached to it which reads, "The Crew used this Apollo 17 CSM Lunar Landmark Map to study the Moon from Lunar Orbit - Gene Cernan - Eugene A. Cernan Apollo 17 Commander" which has also been hand signed by Gene Cernan. The Map comes attached to (but removable from) a large foam board measuring 13x19 inches which shows a photo of Gene Cernan holding the complete Lunar Landmarks book.